The folks at Burkholder’s HVAC is experiencing fleet growth and recently brought us this brand new Chevrolet Silverado work truck. Our 3M MCS Certified team gave this white truck a touch of truck lettering, along with a partial graphic vinyl wrap. This clean design really stands out among other HVAC providers whom typically have traditional vehicle lettering. Check them out at www.burkholders-hvac.com. We consider old school cut vinyl graphics to function as a means of identification and not necessarily as something that stands out in today’s competitive marketplace. Sure, lettering may get the basic job done. We know this since IDWraps.com did start off in this type of business. Fro many years, this strategy served our clients well. Unfortunately, this method of vehicle graphics has become rather the bare minimum for getting noticed on the road these days. In a sea of vehicles with graphics installed, it is becoming way more competitive if you are looking to get noticed. It is not always a necessity to wrap an entire vehicle. 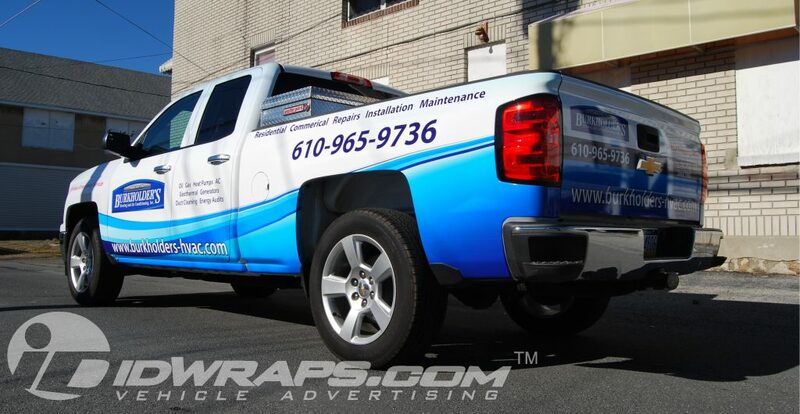 Enter the vehicle wrap / truck lettering “Hybrid.” This economical offering blends the new wrap technologies and flash, along with lower cost lettering applications. We’ve surely been noticing an increase in HVAC wraps and sort of “hybrid” wrap / truck lettering projects. Many folks are turning their fleet vehicles into mobile billboards. The average small community traffic light has at least 10,000 cars passing daily. This brings the cost per impression for vehicle wraps down to pennies per view. Try that with any other advertising medium. The other benefit is the increased brand image and trust factor gained when arriving at a client or prospects job site. If you show up in a plain old truck, this may leave a bad impression in the eye of potential business. Today, service providers must put their best foot forward when bidding on jobs. It’s not always about price. Many studies show that for most consumers, price is not top priority. It’s not a far stretch that the head of a household would prefer to have a true professional working in their home and not worried that the technician is scoping out their valuables and planning for an “after hours visit.” So pull up those trousers and enhance your brand image today with a truck lettering or wrap design on your vehicle :) We work with existing logos, and also develop brands from scratch so you may compete with the largest of competitors. The Burkholders HVAC example pictured below is an excellent example of a Hybrid wrap project. It offers a mix of traditional spot truck lettering, along with an attractive full color wrap stripe along the bottom quarter and rear tailgate. This one is sure to stand out over trucks that may have traditional graphics installed. This strategy is easily transferable to any type of business. Nice and clean- it easily gets the job done. In the end, branding has become a very important component when it comes to driving new business. It never pays to look like a “schlub” when out on the road. Your brand is the very first thing that folks are impressed upon. This happens whether you’re pulling into the neighbor’s driveway, handing out your business card, when seen on your company t-shirts, on your website, and on and on. So what does your logo say to prospective buyers? Does it stand prominently and exude quality service or products? Or- does it make you look a little trashy? A good brand will tell the story at just a glance. It should resonate with suspects that have zero familiarity with the company. Branding can be a potential long road for folks that need to get it right. Plenty of effort and expense may be sensibly justified when considering the duration for the use of a logo, for example. Most marketing experts suggest that the average lifespan of a logo may be roughly 10 years. With this thought in mind, lets give a thought to an amortized cost. Let’s say you invest $1k into branding development. In our line of work, this seems to be a rather average marketing expense for any small business. If we are to divide that cost over the lifespan of the logo, we come up with an amortized investment of $100 per year, or $8.33 per month. If you think about it, branding isn’t so expensive at all! In fact- most professionals would say this is dirt cheap. If your in business, and you get a monthly bill for $8.33, you’d likely invite this invoice- as it is very likely the cheapest liability you are going to encounter. A good example of logo development would be the IDWraps.com logo. Like it or love it, this image was the culmination of 150 plus versions, and many rounds of revision work. Our goal was to develop a national trademark, and invest in a brand that will drive success and validate our trademark registration expenses. Nonetheless, this logo has thousands of dollars behind it. Still, when at trade shows across the USA- we get noticed and recognized. The branding is simple, easy to read, and memorable. In addition, this logo is simple enough to be used for any medium. It works well for single color use (monochromatic,) embroidery, web, and any kind of print. If your logo can’t be used effectively on a rubber stamp, it may be time for a new design. Simple is surely best. If you need proof, please do take a quick study of the largest brands you know. What are your thoughts on the likes of Apple, Google, Microsoft, Under Armor, and Nike? Yeah, you will undoubtedly notice the trend, right? So, why the need for so much fireworks and illegible images? Yes, there is no need at all for this visual circus. That is what the big brands understand so well. Those brands have intense marketing budgets behind them. They have no choice but to get it right! Did I say easy to read? Whoa- there’s an interesting concept! In many markets, we are witness to scribble looking typefaces on truck lettering, and vehicle wraps alike. So the artist thought he/she was doing the client a favor with that over the top busy design with ILLEGIBLE and overly artistic fonts. Folks- I’ll say this once: If you can’t read it, the advertising investment has failed big time. So what if the art is pretty and it draws attention. What if no one knows who you are or what you do? Those are two of the three significant factors of effective marketing messages. Who you are, what you offer, and how to reach you. It’s really not an overly complicated concept. Don’t allow anyone to scribble all over your vehicle! Always have a good look at their portfolio. Do their designs convey marketing messages clearly? Do their designs make a prospect confused as to the message being conveyed? We like to do the 3 second flash test. Images are shown to an anonymous individual for 3 seconds, and then the image is hidden. We then ask the individual what the takeaway was. If they are clueless, it may be back to the drawing board. It should essentially be super clear to the viewer as to what the message actually is. You see, 2-3 second is the average time a passerby will give you when viewing your marketing messages. Its a little tough when you’re only given a moment, isn’t it? Nonetheless, a less is more approach is often the best tactic when you have only moments to become memorable in the eyes of prospects. Remember that there are only moments available to make that critical impression!